The award winning 4-star Kingsley Hotel is conveniently located just 280m away from Cork University and 15 minutes’ walk from Cork’s city center. You’ll find the most pleasant room views, with the hotel overlooking the picturesque River Lee. Whether you are visiting for business or pleasure, the hotel offers 131 bedrooms perfectly designed for your comfort, ensuring a sense of tranquility. Winners at the Luxury Travel Guide Spa and Wellness Awards 2018, The Spa at The Kingsley provides a space to re-discover the true meaning of a spa break. 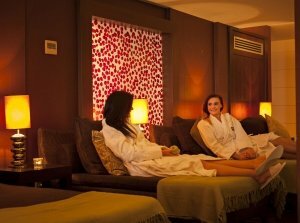 Their spa treatments and array of packages have been carefully designed to encourage total comfort and well-being, whilst using products made with nature’s purest ingredients. Choose from facials, massage & holistic, body treatments, maternity treatments and grooming. There are even special treatments for men so they can enjoy a bit of pampering too! A spa visit here wouldn’t be complete without also experiencing their thermal suite and outdoor pool. Enjoy an overnight B&B for 2 at The Kingsley Hotel Co. Cork worth €460. During your stay you will be served a full Irish breakfast in the morning and treated to a Kerstin Florian Facial at The Spa. How far is The Kingsley Hotel from Cork’s city center? Entries received after the competition closing date will not be entered into the draw. Only one entry is allowed per unique email address. The prize is non transferable and will only be awarded to the winner. No cash alternative will be awarded in lieu of stated prize. If, due to circumstances beyond its control, a prize becomes unavailable Spas.ie and/or the promoter(s) reserves the right to substitute a prize of equal value. The winning entry will be selected in a random draw. The judge’s decision is final and no correspondence or communication will be entered into. Winners must agree to participate in any promotional activities that may be organised by Spas.ie in connection with the competition. Employees of Spas.ie and their families, and any third party included in this promotion are not eligible to enter this competition. Spas.ie will notify prize winners using the entrant's contact details as provided by them at the time of entry. Entrants will have 60 days from initial notification to claim their prize. Spas.ie reserves the right in its absolute discretion to disqualify any entrant, to add to or waive any rules without prior notice to the entrants or in the event of circumstances beyond the control of Spas.ie arising which in its opinion makes it desirable to cancel the competition at any stage. To maximum extent permitted by law, Spas.ie is excluded from liability for any loss, damage or injury which might occur to the winner resulting from his or her acceptance of the prize.